It's high time to change your own room into a theater! Choose our sound bar, you can enjoy a sound feast now at home. > Unique acoustic design with premium sound brings you feelings of coming to a real movie scene. > Infra-red remote control, along with Bluetooth connection, frees you from trammel. You can control the TV sound bar without a move. > Built-in large capacity Lithium battery brings you long-lasting pure sound enjoyment. > Insert a TF card with MP3, WMA, WAV, FLAC and APE files in it and enjoy the unbeatable music. > Thoughtful power-saving design enables itself to automatically switch to "Sleep Mode" when it has stopped working for one hour. * If the bluetooth sound bar automatically turns into sleep mode, press any one button on the remote control or on the bar to awake it. * With the low power protection, the device will be automatically powered off if it works under 3.3 V or below for more than 15 seconds. * If your television only supports optical fiber or coaxial connection, you should use an audio decoder (not included) to finish connection. We pay much attention to product quality and your purchase experience. If there is anything wrong that has an impact on your use experience, you can return the product to us for full refund within 90 days after your purchase. If you have questions about how to use it, please feel free to contact us at any time. We will offer the best solution to solve your problem. [POWERFUL STEREO SOUND] - Thanks to the double loudspeakers, you can enjoy lossless stereo sound reaching 80 dB and covering 300 sq. ft. Noise-proof HD chip set in the sound bar for TV ensures you rich sound and a true-to-life home theater experience. [COMPACT DESIGN & BLUETOOTH TECH] - Save space with the slim shape(Size:16*2*2 inch) and decorate your home with its sleek lines. Pair the TV speaker with devices both via AUX 3.5 mm or RCA cables and via wireless Bluetooth. Savor a high-quality sound feast indoors and outdoors.When you search for Bluetooth, you should unplug all the cables that connect TV speakers. 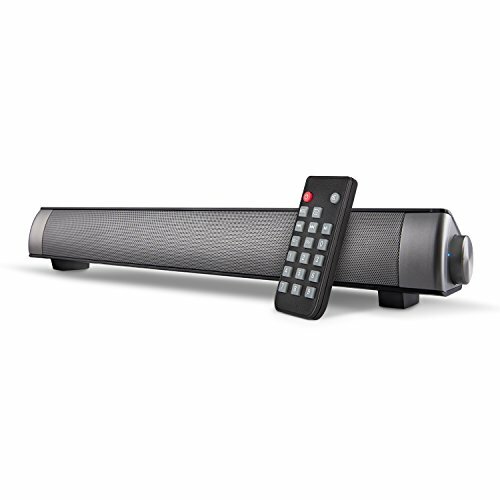 [EASY TO CONTROL] - Press keys on the infrared remote control to operate the Bluetooth sound bar freely in a distance. Too fatigued to stand up or walk to the sound bar to turn it down? Our remote control makes it feasible to operate at a short distance.Food level.rotate the button on the right side of the sound bar for your needed maximum volume. [FIT MOST ELECTRONICS] - This TV sound bar is compatible with varieties of electronic devices equipped with audio players, such as televisions, desktop computers, laptops, smartphones, tablets, MP3/MP4s and CD/DVD players. [90-DAY MONEY BACK & 100% SATISFACTION GUARANTEE] - We promise a 90-day money-back guarantee to each customer. If you have any problem with the sound bar, please feel free to contact us. We will offer you the right solution to your problem within 24 hours. If you have any questions about this product by AwesomeWare, contact us by completing and submitting the form below. If you are looking for a specif part number, please include it with your message.